It's the season of giving. Give the gift of love to a new forest by adopting your very own Bigcone Spruce tree or Coast Live Oak Tree. Come to plant it and pledge to care for it, and watch it grow into a handsome tree. Bark name tags will help identify your tree and when it was planted. We will provide the trees, the tools and the know how, you will bring the work power. 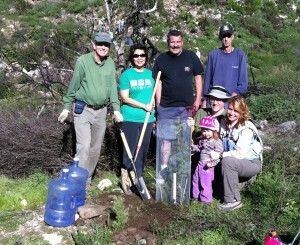 We will be joining the City of Glendale on this day to plant, water and care for the trees. These trees are special since they are the kind that used to grace the hills here centuries ago. You will be part of the effort to reforest this area, which was badly burned by the Station fire. Event is free, but donations to cover the costs of getting new trees would be gladly accepted. Wear enclosed shoes, hat, hiking or outdoors wear, sunscreen. Event is jointly sponsored by the City of Glendale and the Crescenta Valley Group of the Sierra Club. Both Sierra Club and City of Glendale require a liability waiver. Youngsters are welcome if accompanied by an adult. Credit for community service is available. A 1 mile rt walk , may be involved to get to the planting site.